Along with his wonderful wife Miriam, Rabbi Levi taught both of our kids at the Hebrew High School/Midrasha at Chabad of Fairfax, VA. He was a stimulating and patient teacher, who excited the kids (and their parents) to love their Judaism. But more than that: he was a friend to everyone, with a smile and a laugh that never quit. He was a sweet and gentle guy, a real mensch in every sense of the word, who helped everyone he met. 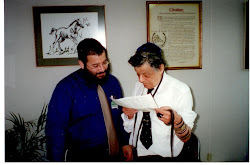 He is responsible for many people reaching new heights of learning and Yiddishkeit, and for that his memory will definitely stand for a blessing. Zichrono l'vracha. We wish strength to Miriam and his entire family, and we send our deepest condolences. HaMakon y'nachem, from the entire Taubman Family.